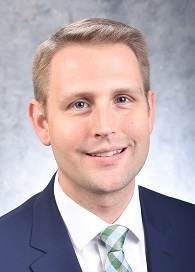 Joshua Hewiett has been named President of Huntsville Hospital Heart Center, LLC, and Vice President of Cardiovascular Services at Huntsville Hospital, effective July 1, succeeding Larry Johnston. The Heart Center includes 50 physicians and is the largest cardiology practice in North Alabama. Heart Center is a part of the Huntsville Hospital Health System and has offices in Huntsville, Athens, Boaz, Decatur, Madison and Sheffield. The cardiovascular program was named one of the Top 50 Heart Hospitals in America and employs 854 people. Hewiett joined Heart Center in 2012 and has served as Director of Cardiology Services since 2013. His responsibilities have included operational, administrative and financial duties. He is a Florida native and graduated from the University of Florida with a bachelor’s degree in finance. He later earned a master’s of business administration degree and a master’s of science in health administration degree from the University of Alabama at Birmingham. Johnston served as the CEO of Heart Center, PC, since 2003. He became the President of the HH Heart Center and Vice President of Huntsville Hospital's Cardiovascular Service Line after the Heart Center merged with Huntsville Hospital in 2009. He will continue to serve the HH Health System as a Physician Practice Advisor as of August 1, according to Samz.